For decades, Pearl Beverly has been investing in the lives of young people in Waco and at Baylor. She has been heavily involved in helping Baylor recruit, retain and graduate minority students since 1988. We honor her faithful service through the presentation of the W.R. White Meritorious Service Award. 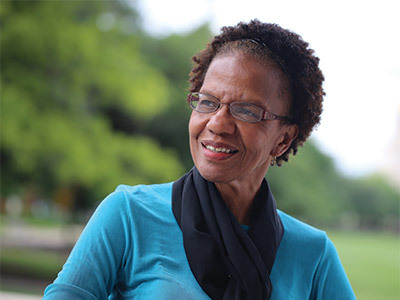 The director of the Department of Multicultural Affairs since its creation in 2005, Pearl Beverly (MSEd, ’01) came to Baylor in 1988 as a recruiter in the Graduate School and transitioned to the Division of Student Life in 1994. Beverly believes that the University’s commitment to diversity and cross-cultural education is essential to preparing men and women for worldwide leadership. She encourages students to celebrate their personal heritage and embrace the cultures of others through education, communication and involvement in the many student organizations across campus, as well as helping with the presentation of cultural awareness programs at Baylor. The Snyder, Texas, native graduated from Lincoln High School in 1965, the last class before the town’s schools were integrated. She turned down an opportunity to play basketball at Wayland Baptist University to pursue becoming a teacher at Jarvis Christian College in Hawkins, Texas, where she met and married her husband of 47 years, Hubert Beverly. At Baylor, Beverly has been at the forefront of fostering a growing minority student population, seeing the percentage grow from 11 percent to 36 percent during her tenure. Beverly is always happy to see the students who visit her office on the second floor of the Bill Daniel Student Center. She has found that building real relationships makes all the difference when it comes to helping students. Beverly is a proud mother of two children, Damian Beverly and Dr. Doriann Beverly (BA ’99, MSCD ’01), but she also loves hundreds of her “other children,” students whom she says are working to make the world a better place. Beverly has been the recipient of Baylor’s Outstanding Staff Award, Outstanding Woman of the Year by Zeta Phi Beta, the Pathfinder Award by YWCA and the Champion of Race Unity Award by the Race Unity Committee, among many others. Her local civic activities include founding and directing Portraits Inc., where youth learn about black history through performance and service. Through every step of her life, Beverly says her accomplishments are for God, to whom she gives all the glory and praise. Awarded to individuals for professional contributions that have positively impacted the world and Baylor University. 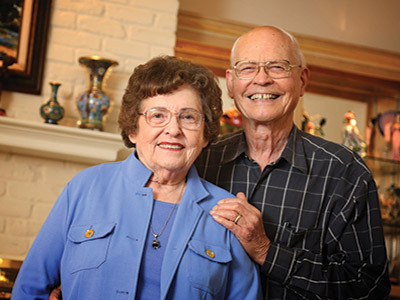 From guiding children, high school and college students to teaching television audiences and Sunday School classes at Columbus Avenue Baptist Church, Bob and Joyce Packard of Waco have worked as a team for over 60 years to touch the lives of tens of thousands of young people both locally and around the world. We honor their significant contributions through the presentation of the Legendary Mentor Award. Bob and Joyce (BA ’52, MSEd ’57) Packard owe their first date in 1953 to a blind date arranged, quite fittingly, by some of their Baylor students. They were married in Alexander Hall with Baylor President W.R. White presiding. Joyce’s time at Baylor has included serving two years as assistant dean of women and dean of women living in Alexander Hall. She was also a counselor at Waco’s Richfield High School for 23 years. Her volunteer activities have included the Waco Welcome Corps, Waco Convention and Visitors Bureau, Baylor Round Table, Baylor President’s Scholarship Initiative, Leadership Waco and Historic Waco Foundation, among others. Bob Packard is a renowned and beloved professor emeritus of physics and Master Teacher who taught at Baylor for 50 years. “Packard Physics,” his introductory course for non-science majors, was an institution. Several years after retiring in 2002, Bob returned to teach the class again for one semester, and students scrambled for the opportunity to learn from the legendary professor. A veteran of World War II, Bob is a Phi Beta Kappa graduate of the University of Texas, where he earned three degrees in physics while working on naval research. He assisted the government of Indonesia in revamping its university physics program and served as a visiting professor in numerous schools in Asia and the U.S. He hosted a Waco television show called “Atomic Age Physics,” sponsored a televised academic challenge program and taught often at Paul Quinn College (formerly in Waco). Outside the classroom, Bob sponsored student organizations such as Taurus, Circle K and Kappa Omega Tau, which he helped design their award-winning Sing acts. He also served on Baylor’s Athletic Council for years and taught Sunday school classes at Columbus Avenue Baptist Church for decades. Bob received a number of Baylor and national teaching awards, including Baylor’s Collins Outstanding Professor Award. In 2004, former students, alumni, family and friends of the Packards established an endowed scholarship in his and Joyce’s honor. In retirement, the Packards remain active in Waco serving as volunteers for various boards and committees. The couple has an exceptional fondness for the young visitors to Baylor’s Mayborn Museum, for which they helped raise funds and where they still volunteer most Friday afternoons.